Much has been made of the lack of success for Bill Belichick assistants as head coaches. One mistake many of them have made is acquiring old Patriots players, no matter what. Brian Flores apparently isn’t going that route. The Dolphins, now coached by former Patriots defensive coordinator Flores, cut receiver Danny Amendola on Friday. 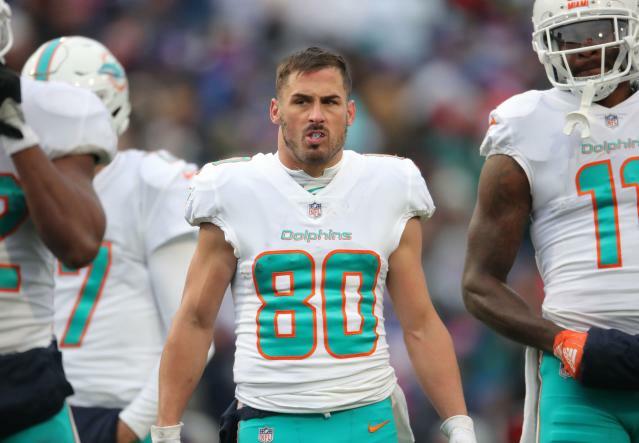 Amendola played five seasons with the Patriots before signing with the Dolphins last year. Amendola didn’t do much with the Dolphins, even though he stayed relatively healthy. He had 575 yards and one touchdown in 15 games. About to turn 34, the Dolphins didn’t see the point in bringing him back. Strangely, a team Amendola could fit well with would be the Patriots. The Patriots could use some extra receivers. Amendola had good playoff success for New England. He knows the system. There won’t be a huge market for Amendola, who is old in NFL receiver terms and coming off a quiet season. It would be pretty funny if the Patriots’ old assistant cleared the way for the Patriots to add to their offense. What are Dolphins’ offseason plans? The Dolphins are a fascinating team this offseason. Everyone seemed to like the Flores hire. But the Dolphins don’t seem too interested in instant success; many reports out of South Florida indicate the Dolphins are willing to tank for a quarterback — namely Alabama’s Tua Tagovailoa — in next year’s draft. How they approach free agency should give us some indication if that’s true. For now, we know the Dolphins aren’t going to hang onto aging veterans, just because of some connection to the old Patriots days. That’s a good sign for the Flores era.